Let’s kick off our Summer Combo Leagues by celebrating Sandy Teter’s legacy! 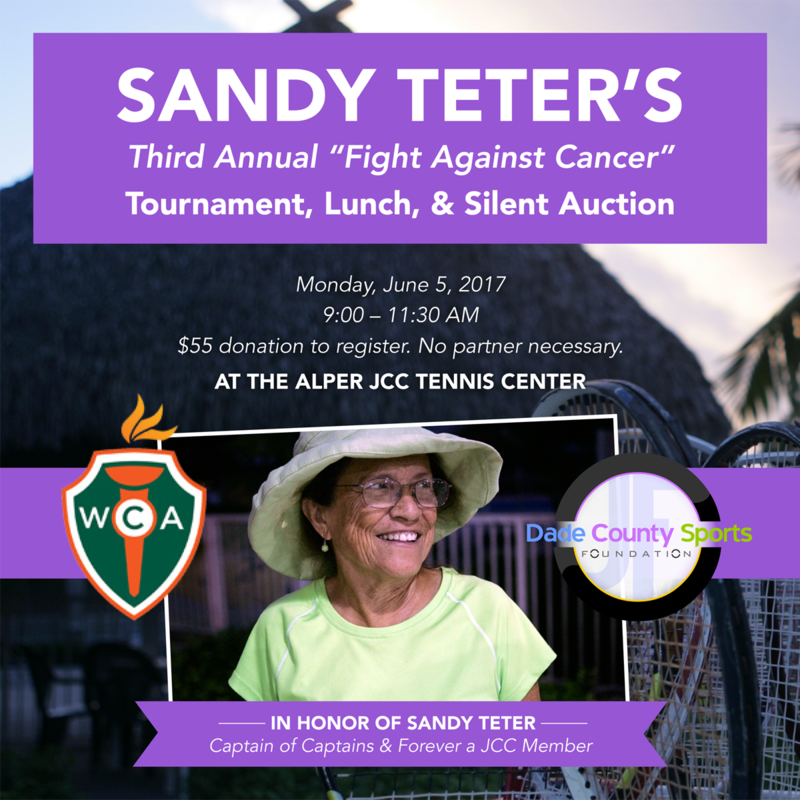 The Women’s Cancer Association (WCA) of the University of Miami and the Dade County Sports Foundation (DCSF) have partnered up once again to bring you the Third Annual “Sandy Teter’s Fight Against Cancer” Tournament & Lunch at the Alper JCC Tennis Center. The tournament will be on June 5, 2017 from 9:00 to 11:30 AM, followed by a complimentary lunch, along with a raffle, silent auction, and goody bags! You can register with or without a partner. The registration fee is a $55.00 tax-deductible donation per player, which will benefit both the Women’s Cancer Association and Dade County Sports Foundation. If you don’t wish to play in the tournament, you can instead register with a $15.00 donation to attend and have lunch as a guest. Our Mission: The UM Women’s Cancer Association’s primary purpose is to raise money for cancer research, providing grants to the UM Miller School of Medicine’s Sylvester Comprehensive Cancer Center. To date, the organization has contributed over $12 million for cancer research at UM. The Dade County Sports Foundation, a nonprofit under the umbrella of Jane Forman Sports, grants athletic scholarships to deserving children in our community.